Furniture polishes are pastes, creams, or lotions used to clean, protect, and shine wooden furniture. These products were originally made from natural waxes, which were hard to apply and tended to leave a heavy buildup over time. Today these formulations combine natural waxes and oils with petroleum based ingredients and synthetic polymers. These modern formulations can clean the film residue and lay down new polish in a single step so periodic stripping of old polish layers is not necessary. The most popular form in the United States today is aerosol furniture polish, which sells over 80 million units per year. However, these aerosol products are coming under scrutiny as new legislation regulates propellants that can be used in these products. Wood has been used for ages for making furniture such as tables, bed frames, and sofas. As a natural material, wood is vulnerable to the effects of aging which means it can become dried out, cracked, or stained. Since biblical times, and probably before, people have recognized the usefulness of coating wooden surfaces with oils, balms, and unguents. Early historical accounts have been found with instructions for using linseed or cedarwood oil to treat wood surfaces. Other natural oils used for polishing wood include tung, and Perilla oils. In twelfth-century Italy, these oils were commonly used to polish wooden floors. By the fourteenth century, beeswax was being used to treat inlaid wood and parquetry floors in France. Beeswax became a very popular wood polish but had to be applied with hot irons and then hand buffed. Despite this drawback, beeswax, sometimes mixed with hard animal fats, remained the predominant form of polish until the late eighteenth century. In 1797, a natural plant wax, called carnauba wax, was discovered on the leaves of the Brazilian cerara palm. Carnauba wax is tough, high melting and, when properly compounded, imparts a fine shine without all the buffing required by beeswax. By the late nineteenth century, other waxes were discovered and polishes were developed that utilized blends of carnauba with ouricui, candelilla, esparto, sugar cane, cotton fiber, flax, palm, hemp and raffia waxes. By the early 1900s, petroleum chemistry yielded a number of raw materials, which were useful in polish formulations. These included paraffin waxes (which can be varied in melting point and hardness) and inexpensive solvents (like kerosene and naphtha). Similarly, mineral waxes, like montan wax, became commercially available and were incorporated into polish products. By 1929 chemists had prepared a suspension of camauba wax in a soap and water base and marketed it as the first self-polishing wax emulsion. This formulation was an improvement over its predecessors because it required less buffing but it had significant drawbacks because it caused streaking and the soap tended to make it more easily removed upon contact with water. In the last few decades, synthetic polymer emulsions have been introduced which offer significant improvements over wax systems. The most widely used polymers are based on silicone oils, which provide lubricity and good gloss. Aerosol sprays are the most popular delivery system for these products because they offer easy application over a large surface area. In addition to ease of application, today's products offer excellent gloss, wear-ability and water resistance. The primary ingredients used to prepare furniture polishes are polishing agents, solvents, and emulsifiers. Auxiliary materials include preservatives, colorants, and fragrance. The waxes, polymers, and oils are used to improve the condition of the furniture surface can be loosely grouped together and labeled as polishing agents. The waxes employed can be of vegetable, animal, or mineral origin. Common examples of vegetable waxes are carnauba (from palm leaves) and candelilla (from the Mexican plant of the same name). Sugar cane wax, cotton wax, and many others are also used. The primary animal wax (or more accurately, insect wax) is beeswax which is useful for its unique physical and chemical properties. Shellac is another popular insect waxes, which comes from the lac insect of the genus Ficus religiosa. Spermaceti wax, from the sperm whale, was popular at one time but ecological concerns have forced development of synthetic replacements. Lanolin fractions from sheep may be used as animal waxes. Mineral waxes, although they are not true waxes by definition, have similar chemical properties. These can be categorized as ozokerite, paraffin waxes, microcrystalline waxes, oxidized microcrystalline waxes, Fischer-Tropsch waxes, and montan waxes. In addition to these naturally derived waxes, synthetic resins are also commonly used in polishes. These include a multitude of polymers, some of which were originally developed for use in the paint and coating industry. These are materials like methyl acrylate, ethyl acrylate, butyl acrylate, vinyl acetate, styrene, vinyl chloride, acrylonitrile. Finally, oils derived from vegetable, petroleum, or silicone sources are added to formulations to enhance shine. Solvents are used to help dissolve or soften some of the water insoluble materials used in polishes. Common solvents include mineral spirits, turpentine, and naphtha. In addition to solvency, factors to consider during solvent selection include flammability and toxicology. Proper blending of oil and water-soluble ingredients requires special chemicals known as surfactants (short for surface active agents). These surfactants (which may also act as emulsifiers) have the ability to bridge water and oil to create a stable cream, paste, or lotion called an emulsion. Propellants are liquified gases, which are used to dispense aerosol products as a spray. The most common propellants are short chain hydrocarbons such as propane or butane, both of which are highly flammable. In addition to the ingredients listed above, polishes may contain abrasives, colorants, fragrance, and preservatives. Still other ingredients are added to limit the chance of corrosion of the metal can. These are often nitrogen containing materials that raise the pH of the solution. These ingredients can be formulated into pastes, creams, liquids, and aerosol (including non-aerosol pump sprays). intended to add protective shine, and still others are made to also to clean and remove dust. The formulator must recognize what kind of surface finish the wood has and consider its attraction for dust and resistance to water spills and grime. Safety and toxicological concerns can not be overlooked and there may be regulatory issues, which affect polish formulation as well. The manufacturing procedure for furniture polish varies depending on the type of product being made. The following is a discussion of the mode of manufacture used for aerosol polishes. The production of aerosol polishes requires four important operations: compounding the wax emulsion, filling the primary container, pressurizing/gassing the can, and finishing operations. pumping out the finished product. When the water and oil phases are at the appropriate temperature 158-176° F (70-80° C) they are mixed together using a turbine type mixer that provides relatively high shear. Typically the oil is pumped into the water phase. Heating and mixing continues until the batch is homogeneous at which point cooling is initiated. As the batch cools, other ingredients such as preservatives, dyes, and fragrance are added. When the batch is complete, it is assayed to insure it meets quality control standards for solids, pH, etc. The batch may be pumped to a filling line or stored in tanks until it is ready to be filled. 2 Aerosol furniture polish is packaged in metal cans, which are capable of withstanding the pressures required by an aerosol product. Typical can construction may be tin-coated steel or aluminum. When the product is ready to be filled into the package, the emulsion is pumped to a filling line outfitted with a conveyor, which carries the cans to the liquid filling equipment. At the filling head, there is a large hopper which holds the polish emulsion and discharges a controlled amount, usually set by volume, into the can. 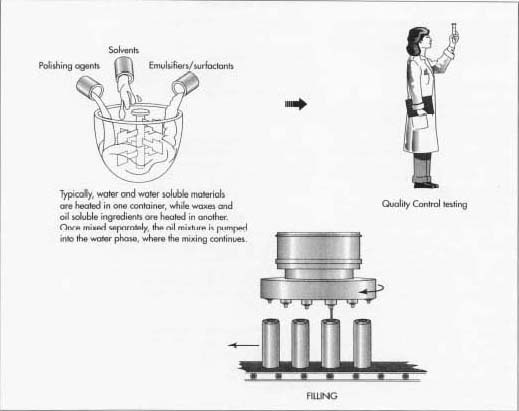 The filled can then proceeds down the conveyor line where, depending upon the production method, the valve may be inserted and sealed in place immediately before gassing. 3 After the can is filled with the polish concentrate, propellant is added in a process known as gassing. 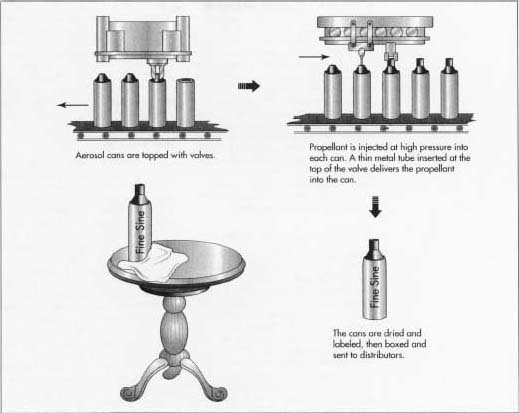 Aerosol cans may be gassed before or after the valve is crimped into place. In order to fill the can, the propellant is shot into the can around the circular metal cup that forms the base of the valve. This method, which is preferred for economy and speed, is known as undercupping. The other gassing method fills the propellant under high pressure through the stem of the valve after it is crimped in place. This method, known as pressure filling, is much slower because all the gas has to enter the can through a very small opening. Both operations are conducted with special pneumatically operated equipment, which is properly grounded to limit the chances of electrical spark, which can trigger ignition of the highly flammable propellants. 4 At some point during, or immediately after, the filling operations, the cans are coded with the date and other batch information to allow traceability. This is useful because if there is a problem with a specific batch of products, for example a spoiled raw material does not allow the emulsion to be stable, then the finished goods made with that lot of raw material can be traced. If necessary, this number can even be used to issue a product recall, although this is a rare occurrence. The can is also usually capped with a plastic overcap, which prevents the valve from being accidentally triggered causing leakage of the slippery contents. After final capping and coding and after the appropriate quality checks, the cans are packed, usually in cardboard shipping cartons, and palletized. They are then sent to a warehouse or distribution center to await final shipping instructions. Quality of furniture polish is assayed at various points in the manufacturing procedure. Before manufacture, the raw materials are checked to ensure they conform to specifications. After the product is batched, it is analyzed to make sure it was correctly prepared. Key formulation parameters include water content, pH, solids level, and preservative activity. After the product is filled into aerosol cans and charged with propellant the spray characteristics of the valve are checked. The can is passed through a heated water bath to ensure it does not leak. Before filling, a representative number of cans are tested to make sure they are of the appropriate strength. The United States sets limits for bursting strength of aerosol cans. As with any technology driven product, improvements will be made as the advances are made in underlying technology. For example, new silicone polymers are constantly being developed and some of these are likely to be incorporated into future furniture polish formulations. Perhaps the most significant changes in store for the future of the polish industry are likely to be driven by regulatory concerns. Air pollution legislation is limiting the types of propellants and solvents used in furniture polishes. In the mid-1970s a similar situation occurred in the antiperspirant industry. Safety concerns caused aerosol antiperspirants to almost vanish from the market where they were originally the most popular type. Whether the industry will respond to regulatory challenge with improved aerosol formulations, non-aerosol pump products, or some new delivery system altogether remains to be seen. Chalmers, Louis. Household and Industrial Chemical Specialties. Chemical Publishing Co Inc., 1979. Flexier, Bob. Applying Finishes. Rodale Press Inc, 1996. Lawrence, David. Stripping and Polishing Furniture. International Speciality Book Services, 1987.